This walk is a circular night walk, starting at sunset, taking approx 3 hours. We start and end around the Park St, Sudder St area and guests can then move off to have an evening meal straight after the walk or can easily catch a metro or cab back to their residence. This walk has been running for nearly 18 years and scores of visitors have taken the opportunity to take in the sights of Kolkata inner city life after dark. We wend our way through narrow lanes and through contrasting communities. Initially we need to get out of the business and commercial area around Park St but after a short time we are in a predominantly Muslim community. Street life is active as people eat, play and work on the streets. Local mosques abound and the street food is delicious. 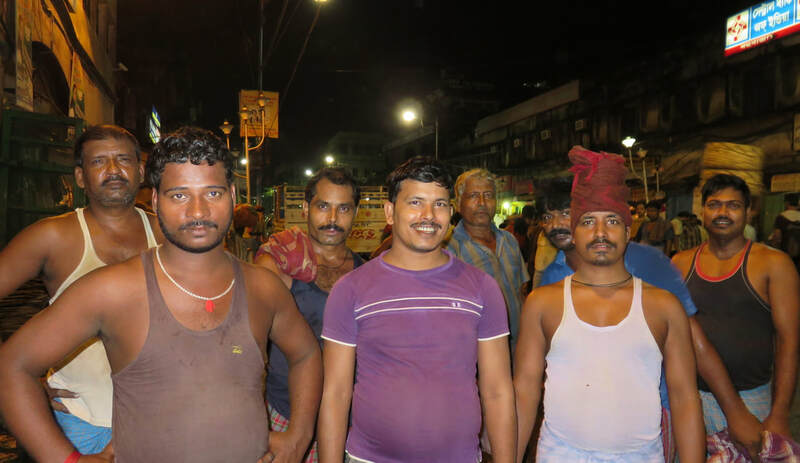 You will notice the different occupations of night workers as you move from this community to the largely Hindu community it melds into. Here the houses a a little grander and streets a little wider but still this is an old, established district with narrow lanes and local temples. This area snakes its way to the all night vegetable market where workers you see in the photo above carry fresh produce into the market to be distributed to all parts of the city the next day. 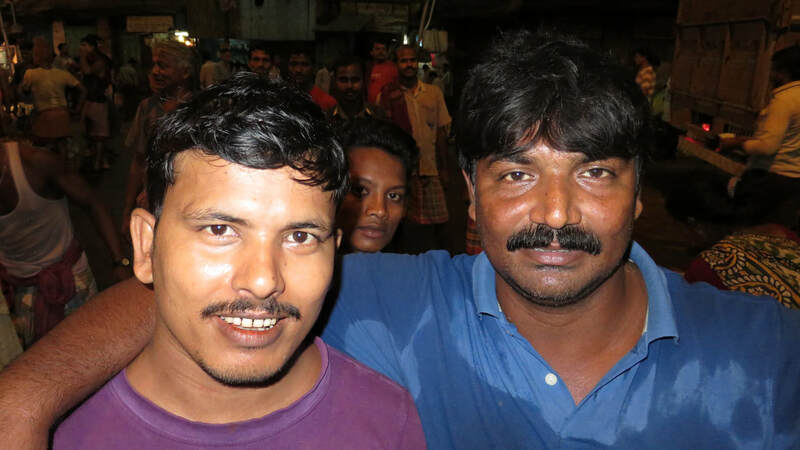 Market Workers pose for the camera. This walk aims to get people who are a little reluctant to explore the city after dark to join us and see that in some ways the city is even more vibrant and fascinating after the sun sets. At this time you will see more young people as they have returned from school and now have free time to get out and roam. Away from the heat of the day people gather in parks to sip tea and catch up with the days gossip. Food is being prepared and served for evening snacks and meals. Still work is going on in small tailor shops and jewellery making workshops. We stop to see how communities support themselves and you can have a tea at a local tea stand or purchase street food as we go if that is what you would like. The walk meanders it way back to Chowringhee via Chadney Chowk electrics market and the New Market just as it is shutting for the night. For those who would like to end the night in a local bar with snacks or a meal we can end the walk at just such a bar right next to a metro entrance for those who might like a drink before they train it home.